Kentucky: United we stand, divided we fall. 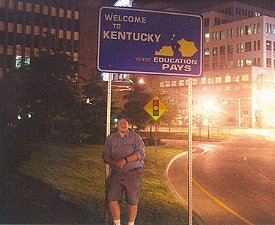 I went through Kentucky on my May 2000 road trip to Cincinnati. It was the first time that I had driven into a state in which I had never been before. Every other time was either in an airplane or in a vehicle driven by someone else. I crossed into Kentucky on I-64 at the West Virginia state line. I saw this same sign there, with the "Where Education Pays" tag line. (I showed some of my co-workers my pictures from the road trip. Each one who saw this picture had some kind of comment about that slogan.) The West Virginia-Kentucky border by I-64 is a river, and the sign assembly is actually affixed to the bridge itself. The shoulder was too narrow to safely take a picture, so I continued on, visiting Frankfort and Lexington. While in Cincinnati, I walked across the 135-year-old Roebling Suspension Bridge, over the Ohio River and into Covington. Just beyond the bridge the road divides, and in the median is this welcome sign. It was just after 9 pm when I took this picture. I took two shots, one with a long exposure and the other with the flash, and the long exposure worked the best. It's a good thing that this was in a fairly well-lit area, otherwise I would have had to come back the next day and I really didn't have the time to do that. I crossed the Ohio both on the Roebling Suspension Bridge and on I-71/75, and neither of those bridges had Ohio welcome signs. And fortunately as well I didn't have to drive up and down the Ohio and Indiana state lines looking for a Kentucky sign. I didn't look around Covington too much. There are a few bars, restaurants, and hotels along the river, all with great views of the Roebling Suspension Bridge and the Cincinnati skyline. There is a floodwall down by the riverbank. A riverwalk goes east along the Ohio towards the Licking River with a few historical markers. I took a picture of the marker for the Roebling Suspension Bridge but the photo was illegible. Just as I was setting up the tripod, about seven twentysomething girls came running up to me. One asked me for my phone number. But alas, they were on a bachelorette party scavenger hunt and needed five guys' phone numbers. Haven't heard from them yet. Frankfort is a fairly small city from what I can tell. I didn't actually see it though. 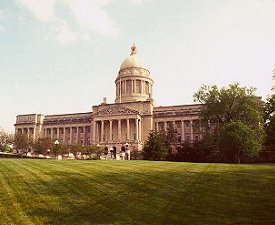 The Kentucky State Capitol is a few miles west of downtown. 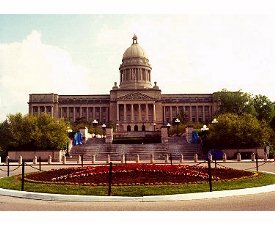 There are two exits for Frankfort off of I-64; the eastern exit goes into town and the western exit is primarily for the Capitol. After getting off I-64, I headed north on US-127 for about a mile or so before turning right onto US-60 east for another mile. There isn't much warning for the Capitol; stay in the left lane and there will be a cutout. If you stay on US-60 it passes by a scenic overlook of the Capitol grounds which I didn't make it to. Making a left off of US-60, I went down a hill on narrow Lafayette Drive through a light residential area. At the bottom of the hill the Capitol is right across the street. I drove around the south front from west to east. On the east side of the capitol is a parking deck. When I arrived, there was a lot of commotion; a lot of construction vehicles around and workers milling about. I walked around the south front to where the floral clock is. 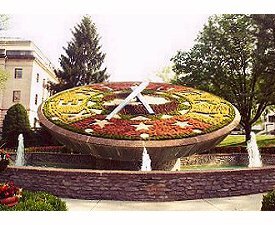 At the floral clock I saw a Kentucky State Trooper whose name I forgot to write down. People in this part of the country are very polite. He explained to me that Gov. 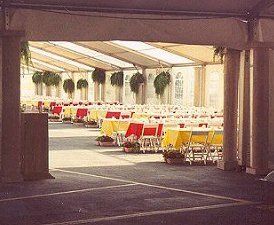 Patton was having a huge party that night to celebrate the eve of the Kentucky Derby. A lot of bigshots would be there and he would soon have to start chasing non-invitees away. I mentioned this project to him, and he asked me if I had ever been to Olympia, Washington, which I hadn't. After telling him that I was from New Jersey, he asked me if The Sopranos is big up there, to which I replied that the major New Jersey paper regularly has columns in the TV section about the show. He asked if the show created New Jersey stereotypes, and he told me that people in Kentucky really "get hot" when they are called hillbillies, "even though we may speak with a southern accent." I walked around the large capitol, which was built between 1905 and 1909 with a pricetag of $1,820,000. With a façade of limestone from Indiana and granite from Vermont, this is Kentucky's fourth capitol; the statehouse built in 1830 is still standing. 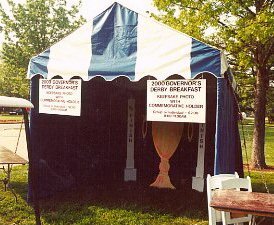 It is surrounded by lush lawns of Kentucky bluegrass. 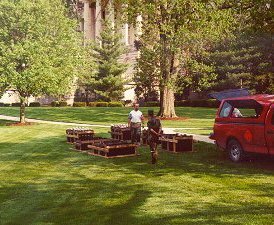 In front of the Capitol's main entrance on the north front, there is a wide plaza of granite steps and walkways from the doors down the hill to the street. A small traffic circle separates the plaza from the divided tree-lined road leading down to KY-420. At the center of the the circle is a floral arrangement in the shape of a large star. 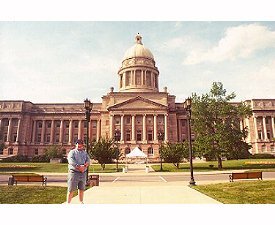 Kentucky has a good Capitol, though isolated. 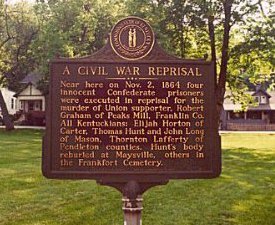 It seems separated from the rest of town and, coming from I-64, it seems almost hidden; unless you happened to catch the sign you would have driven right past Lafayette Drive. It is nestled into the hills and from the parking deck has a nice view of the Kentucky River. The next day, Fusaichi Pegasus won the roses by a length and a half. This page loaded in 2.661 milliseconds.